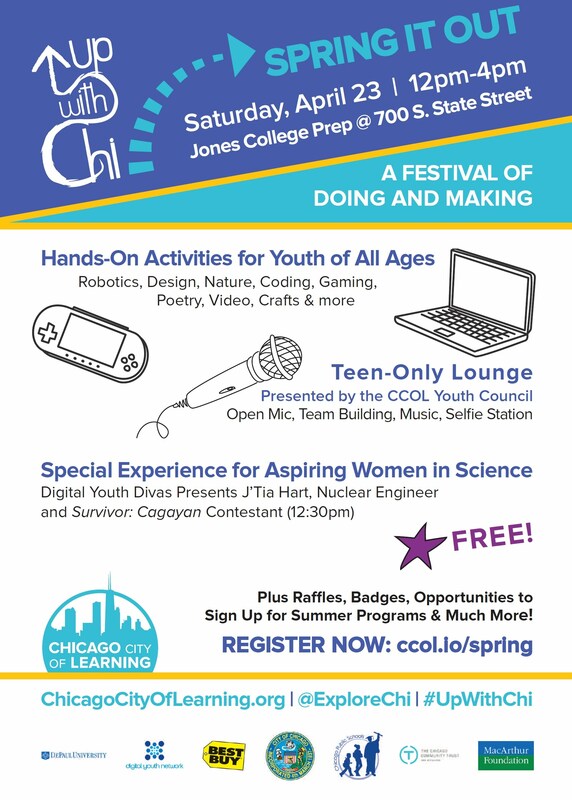 Chicago City of Learning’s big spring event, is almost here! We’re writing to make certain no child or family misses out on this chance to sample on-site and on line summer (and year-round) programs for youth from 4 to 24. On Saturday, April 23, more than 30 organizations will again be at Jones College Prep to introduce young Chicagoans to some of the hundreds of programs available to them. Younger children can discover new skills and talents at a Maker Party – with opportunities for art, spacecraft, building and garden design as well as game playing and making – and even robotics. High School students will enjoy designing apps, jewelry and more in a Teen Only Lounge, plus an Open Mic experience for the writers, poets and rappers among them. Girls might be particularly interested in the Digital Youth Divas workshop, where they’ll get further insight (and hands-on experience) on how their interest in fashion and dance connects to their studies in science, technology and math. There’s something for every family in the 28th Ward! Youth and families are invited to get a FREE taste of summer programs offered by Chicago City of Learning partner organizations citywide. A Maker Party and a Teen-Only Lounge will feature hands-on activities to meet every interest, including robotics, nature, architecture, forensics, conservation, engineering, art, music and more! Register now at ccol.io/spring.